Lubricant plants are facing ever-greater challenges during daily operation. These challenges demand flexibility to manage and modify recipes and the movement of numerous types of raw components. These challenges are directly linked to the efficiency, profitability and safety of operations at a lubricant plant. Yokogawa can provide a complete portfolio of fully integrated solutions for your lubricant manufacturing plant, in order to optimize performance and guarantee plant-wide operations. Manufacturing a finished lubricant oil for commercial use is a simple but rigorous formulation process in which numerous additives are added to the base oil in specific quantities. The choice among the many different types of additives and base oil grades, and the selection of the manufacturing method can result in hundreds of types of lubricant oil products. Thus, the manufacturing process is a sophisticated task that requires a reliable and flexible batch management system that can accommodate numerous recipes for the manufacturing processes. Yokogawa offers world-class flexible and scalable batch recipe management for manipulating different process units to make products using a variety of methods. CENTUM VP Batch is key in providing modularity, flexibility, ease-of-use, outstanding reliability, and sophisticated functionality to meet all requirements of a lubricant manufacturing process. In order to improve production efficiency at lubricant blending plants, customers are seeking solutions to optimize the management of stock available in their plants, to quickly alter production in response to market demand, to reduce contamination caused by the flow of material within common facilities due to human error, and to integrate production data with manufacturing execution systems. Yokogawa has a wealth of experience in lubricant blending projects and has developed comprehensive MES solutions focusing on the chemical/lubricant industry. These solutions include scheduling solutions for batch/recipe management, stock management and SOP management solutions. With Yokogawa's MES and SOP integrating solutions, an operator may operate from MES, choose a recipe from a list, and activate a predefined SOP for batch production. After the batch is accurately completed, a report is automatically issued. Production results are then updated in the MES database and uploaded to the ERP. Since the release of the world’s first DCS in 1975, Yokogawa has delivered plenty of projects globally to the lubricant manufacturing industry. Yokogawa understands the operational challenges impacting lubricant manufacturing today and is able to leverage extensive application experience combined with cutting edge technological solutions to provide a sustainable automation offering for the lubricants industry, such as lubricant terminal automation solution. With experience and know-how, Yokogawa provides support in lubricant manufacturing with respect of continuous improvement and full utilization of manufacturing assets. Yokogawa’s customers expect a standard approach in project execution and delivery, regardless of the location where the solution will be delivered. Based on our comprehensive experience in lubrication projects globally, Yokogawa consistently provides standardized solutions to our customers no matter where they are located in the world. Yokogawa’s solutions are both integrated and scalable and suitable for customer building a new site or expanding/upgrading an existing one. Complex lubricant plants require continuous support to operate reliably over a long period of time. 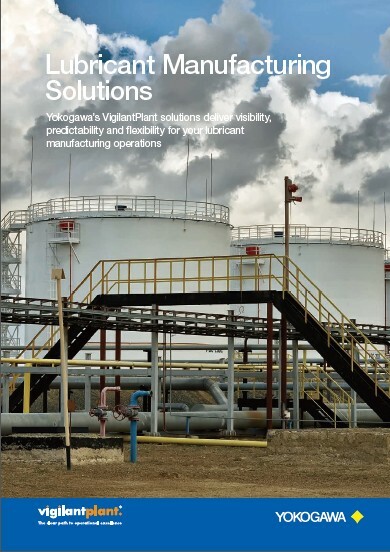 As a committed partner, Yokogawa offers original VigilantPlant services and makes it possible for lubricant manufacturers to maintain operational excellence over the entire plant lifecycle. VigilantPlant services can identify new improvement possibilities in your lubricant plants and implement identified solutions effectively while achieving a rapid and signicant return on investment.